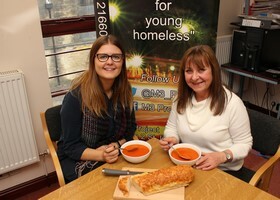 Homeless charity M3 Project set up a fundraising idea to encourage people to host a Big Soup Social to get people together and raise money and awareness of the organisation. I have worked for M3 for several years to raise awareness of the charity and I specialise in speaking to householders and young people who have been through the programme to tell their stories. 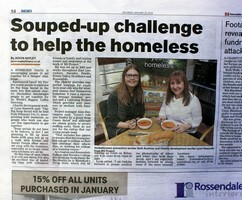 The Lancashire Telegraph used my story as a page lead, it appeared in the Rossendale Free Press and I was able to arrange for Charity Development Co-ordinator Lynn Howarth to be interviewed live on BBC Radio Lancashire’s mid-morning show by Sally Naden and Brett Davison. My schools have certainly been keeping me busy since the last work update blog – I have written 31 stories for my contracted schools of Haslingden High School, Fearns Community Sports College and Whitworth Community High School. The schools have been in the press for a variety of reasons. At Haslingden High School sporting prowess has been to the fore with success for footballers, athletes, badminton players and trampolinists. The students helped to rase money for a rescue dog and were delighted when Seb came to pay a personal visit, while others have visited Cambridge University, landed places at a prestigious dance school and raised thousands for good causes. At Fearns pupils will be representing Burnley Football Club after coming up with an imaginative way of increasing minority group membership of the club, learnt employability skills, raised the most pupil to pound ratio for Rossendale Hospice in the Youth Enterprise Challenge and enjoyed an equestrian rewards trip. Whitworth students won the Youth Enterprise Challenge after raising the most money and the school’s football team are a game away from a national semi-final and the students are reading their way through pages and pages to select Lancashire’s Book of the Year. The latest JJO Journal has been published and a news story on a stunning photograph of a JJO wagon being used by Scania for the 2018 calendar also made the Lancashire Telegraph. Veterans In Communities never stops being busy. I produce monthly newsletters to reflect the work of the charity as well as news stories and when VIC member Tony Stubbs was shortlisted for a national award his story was used by the Bolton News. I will be covering three different business awards this year, Rossendale, Hyndburn and also Ribble Valley. As Hyndburn’s ceremony is first, the launch story has already been written. If you want me to help you tell your story, just drop me an email.